Life has been hectic lately and I have been forced to take a break from crafting and blogging. I will be back but not sure when at this Stage. To celebrate the start of Spring, Stampin’ Up! has a new promotion where you can earn something for FREE…yes I said FREE. So what do you have to do you say? Easy peasy. Either spend $100 on product or hold a workshop with product sales over $600 and you will be rewarded with two rolls of ribbon for FREE. These ribbons are not available at any other time. They are Certainly Celery (9.1m 5/8″ Poly-twill Ribbon) and So Saffron (9.1m 5/8″ Grosgrain Ribbon). So what are you waiting for? Contact me today to take advantage of this special time limited offer. See you all soon with another project. It was my dear friend Julie’s birthday yesterday. To help her celebrate I made her a Tri Shutter Card – my first. I am so excited to have finally bitten the bullet and made it. Special thanks goes to Leonie Shroder for the kick in the pants to make one, and to Beate Johns for her very helpful video. I certainly am a visual person and I love to “see” something created. I hope you had a lovely day yesterday Julie, even if you did have to play “mum’s taxi” last night. I hope the family spoilt you rotten. I used the lovely Bella Bleu DSDSP to decorate the card, pearls from the Pretties Kit, lots of layers and piercing with the SU template. Tell me what you think. Til next time, keep smiling and stamping. One of my work colleagues had a birthday last Monday and this is the card I have made for her. I have used one of my favourite colour combos of Regal Rose, Rose Red and Old Olive. I stamped the cupcake from Party Hearty using my markers in Regal Rose and Creamy Caramel. The candle is Rose Red and Creamy Caramel. I stamped the cupcake image twice and cut out the icing and placed it over the first image using dimensionals. I have layered several layers of cardstock and the pink spotted DSP is from Sweet Always DSDSP. I added some Old Olive Ribbon and used the Birthday greeting from the new Spring Mini Catty, which I punched out using the mid sized Oval Punch and complimented this with using Old Olive Cardstock to punch a oval Scallop. I then stamped the cupcake in the same colours onto my whisper white envelope. I love to have my envelopes to match my cards. The recipient gets a sneak peek at what is inside. I hope you have had a Happy Birthday Dianne and that you like your card. I love to create ATC’s or Artist Trading Cards. What are they you ask? They are small works or Art created to trade or swap with others. Over on the Elite Stampers Forum, headed by Angela Sargeant, we have monthly challenges. This is Angela’s Stampin’ Up! downlines forum. I have taken part in a few of these challenges this year. It is always fun to see what others come up with. The variety of work is amazing and inspiring. I thought I would share my cards with you. This is the swap I created for Februarys challenge. The topic was Stampless. At first I thought, what on earth can I make that has no stamping!!! *shock* If you sit down and think about it, it isn’t actually as difficult as you first think. This card is just squares of patterned paper set out like a quilt. I have done some faux stitching around the edges to make it look sewn together. Originally I was going to “sew” around all the “seamlines”, but I felt it looked overdone and only did the outer edge. I have added some ribbon and hodgepodge to complete. Over the coming weeks I will share some more with you. Today is the day in which Australians are asked to wear their jeans to work to support the charity Jeans for Genes. This charity raises monies to fund research for finding cures for many genetic disorders responsible for the death of many children worldwide. I think you will agree this is a very worthwhile cause to support. I have made the following card today to help raise awareness of children whom have genetic disorders. Let’s do all we can to stamp it out. I have used the retired Stamp Set “Pocket Fun” to make this card. 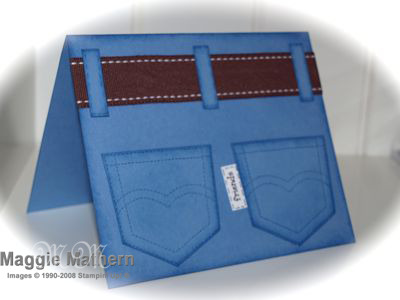 The base of the card is Brocade Blue and I have used the same coloured ink to stamp the pockets. I have sponged the edges of all the pieces in Brocade Blue. The belt is Chocolate Chip Ribbon and I made the keepers myself. I stamped the “friends” from one of the sayings in this stamp set in chocolate chip to make the tag on the jeans instead of a brand name. Til next time. Keep Smiling & Stamping. Since I last posted, that is. What can I say? Life happens. Challenges present themselves and sometimes this means lessening the demands on our time. For me this has meant not having time to create or update my blog. There have been a few moments I have snatched and created, however I have not always photographed these projects or I have, but have not even taken them off my camera. Time to create and blog again. I’ll be back in a few days to show you some new things.